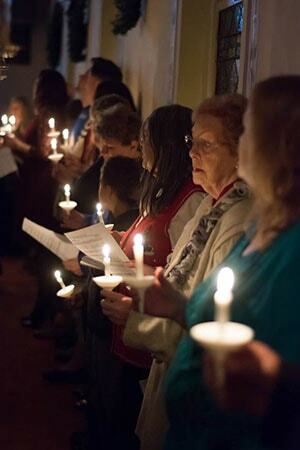 Worship at Trinity United Church of Christ is participative. Folks of all ages and interests have a hand in our worship. Although it’s perfectly alright to sit back and observe. Most people choose to play some role – from reading or acting out the scriptures, to participating in our no-practice, impromptu Christmas pageant, to sharing a prayer concern, to ooh-ing and ah-ing over the babies when they are baptized, to preaching, lay members have opportunities to share the message for the day (including teen preacher, Logan Nave who is 18 years old). We’re a little traditional, a little modern, a lot of welcoming, and a bit casual. We have something for everyone! We like to use sermon series. Sometimes folks receive a small item to help them remember the main message of the series. For instance, the entire congregation once got a piece of sea glass during one of our series. Sometimes we use our communion table as a worship center to help folks remember the focus for the day. For instance, five loaves and two fish (not live) were on the worship center one Sunday. We have a beautiful traditional sanctuary with the latest in media equipment, including a brand new screen and projector. We like to use photographs taken by those who worship with us for our bulletin covers. We are committed to community within and beyond our walls. It seems every Sunday we are blessing something different – like prayer shawls for the sick, foodbags for backpacks, blankets for the people of Nepal, or our Caring Tree gifts. Like our worship, music is participative at Trinity Church. We program music from a variety of genres – from sacred classical, to jazz/Gospel, to country/bluegrass to contemporary pop. Likewise, we strive for variety in our congregational singing. While the beloved canonical hymns are dear to many of our hearts, contemporary hymns and praisesongs as well as the current Christian and Gospel radio charts can offer new ways to understand the Word and deepen our relationship with Christ. 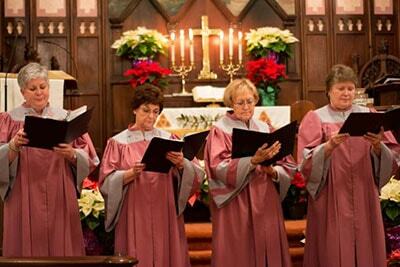 We have a small but mighty choir, who fill our sanctuary with a robust sound each week (from September through May). Our Director of Music Ministry, Lexi Starr, is a young, gifted, and inspiring artist, with a Bachelor of Arts in Music from Swarthmore College. As our congregation grows, we hope to provide more opportunities for gifted instrumentalists as well as youth to participate in music-making during worship. During the summer, the choir’s offseason, our musically inclined members often share musical offerings during worship. Many who cannot make a weekly time commitment utilize this opportunity to glorify God with their gifts. And, we do the occasional special solo during choir season as well. We are currently incorporating our new media capabilities into the worship experience at Trinity, and that includes our music ministry. As we move to a more interactive singing experience using our projection screen, we have more flexibility to seamlessly weave congregational song into moments of prayer, contemplation and of course, unabashed praise. Whether your tastes are classic or modern, upbeat or quiet/contemplative, you will find something meaningful to connect with in our music ministry at Trinity.